A recent story on Search Engine Roundtable reviewed new developments around Google’s “mobile-first” index, here’s how it might affect you. As a refresher, mobile-first indexing means that Google would index websites based on their mobile version, rather than the desktop version. In other words the data that Google stores from your website in order to serve search engine users fast accurate search results will now be gathered from the mobile version of your website. Recent studies have shown that mobile traffic is booming, making more than half of all traffic on the web; therefore, this is a logical move for Google, indexing websites and their content where they have the most impact for their users. This change places a new importance on the content of your mobile pages, since typically mobile pages have a truncated version of the content on their desktop counterparts, much of your site’s content may go unindexed. However, if a site doesn’t have a mobile version it will still be indexed by its desktop version, just as it would have been before. Google has stated that there will not be a separate index for desktop sites, but when the mobile site is absent, the desktop site will be indexed in its stead. 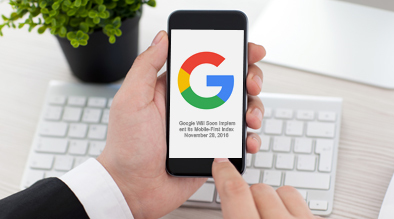 The new mobile-first index is currently in the live testing phase which means a full implementation could be right around the corner. This means it might be time for you to optimize the content on your mobile site.